I am not a big fan of anime. It’s not that I don’t like it or anything; I just don’t watch it and read it as much as I watch and read other stuff. But on the times where I do decide to watch an anime film or read some manga, it is simply incredible. The best example of a case like this is Wolf Children, by Mamoru Hosada and illustrated by Yu. Even though the book is about 547 pages long, I went through the whole thing in less than 8 hours, because reading this manga was like going on an adventure, like watching a full hour and a half movie, which I love when books of any kind do that. The story is the main reason why I love it so much. It’s creative yet realistic as well. A young woman named Hana falls in love with a boy she met at college. Everything is perfect, despite the fact that he is a werewolf of some sort. 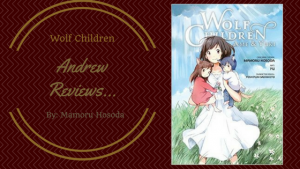 The couple have two children, a son and a daughter, and one day, a tragic accident occurs, and Hana is left to take care of her “wolf children” all on her own. What makes the story realistic is that they put real life problems into the world where werewolf children exist. For example, at one point in the beginning, Hana doesn’t want anyone in the world to know about her kids, and she almost gets thrown in jail for not taking them to a doctor to get their annual checkups. In real life, if a parent does not take their kids to the doctor for annual checkups, the parent could get in big trouble. Another good part of Wolf Children is the actual “wolf children” themselves. As the two grow up, they mature and think different ways, like some siblings do. Around halfway through the novel, I had a pretty good feeling how the book was going to end. But the author executes it so well that I don’t even care. In fact, maybe the author wanted people to know how it ended. And, like almost all manga and anime films, the artwork is beautiful. There are sections in the book where the drawings are colorful, and it looks and feels breathtaking. The only problem I would have is that at some scenes the characters are running quickly, and I can’t exactly understand what’s going on with the way the images look like, but maybe that’s just because I don’t read manga often. I would definitely recommend this to anyone who is an anime fan; anime fans have probably already read this and seen the movie. And even if you don’t like anime very much, I say that you give Wolf Children a try. With an amazing story, great relatable characters, and pretty artwork, Wolf Children is a masterpiece. I don’t actually watch anime but from how you have described the book, sure I’m heading over to the anime bookstore to get a copy.